Near the town of Junin de los Andes, Argentina, the Centro Ecologico Aplicado del Neuquen (CEAN) sits on the bank of the famed Chimehuin River. Biologists at CEAN raise trout for stocking, and they study the impact of new species of flora and fauna on the native environment. WHAT’S THE BIGGEST CHANGE in trout fishing in the past 200 years? Was it the popularization of the eyed hook in the late 1800s? The development of monofilament and plastic fly lines in the mid-1900s? Split bamboo rods in the mid-1800s? Fiber­glass rods a century later? The adoption of catch-and-release regulations? No question about it, those things all led to dramatic changes. But for sheer impact on how and where we fish, perhaps there is nothing that changed our fishing as much as did oceangoing steamship transportation, starting about 150 years ago. As Europeans established their far­flung empires, they usually found the local landscape lacking in some favorite species of life. So, starting with the Société d’ Acclimatation, established in Paris in 1854, there arose a host of European and colonial groups, known as “acclimatization societies,” whose goal was to translocate domestic or wild species of plants and animals from the home country to wherever the colonial outposts were located. Trout were an especially challenging part of this acclimatization process, which the science journalist Yvonne Baskin has called a “massive game of musical chairs we have played with life on the earth.” Unlike terrestrial mammals and birds, which were easy enough to load on a ship and haul anywhere, fish — or, more precisely, fertilized fish eggs — were hard to transport. Even aboard an adequately fast ship, the transport system had to preserve delicate ova, precisely chilled to slow their growth, for weeks or months of travel, often in torrid climates. There is a genuine sense of adventure in the accounts of the first attempts at transoceanic relocation of trout and salmon, especially in those immense journeys from England to Australia and New Zealand, where the absence of trout was keenly felt by colonists. Because of the experimentation involved — in developing the means of transport and in learning if trout could thrive so far from home — the adventure was also a scientific one, attracting eager interest from fisheries managers and anglers. The Salmon' Ponds hatchery in the Derwent Valley of southern Tasmania, where trout eggs arrived in 1864 from England, is the oldest fish-rearing facility in the southern hemisphere. The first attempt to bring salmonid ova to Tasmania occurred in 1852. It failed, as did some subsequent attempts, but only by such narrow margins that the acclimatizers knew they could do it. By 1864, methods for keeping the ova cool and fresh were perfected, and both trout and salmon reached Australia. Very soon thereafter, local anglers were raving about the great fishing — a common refrain in many regions where trout are introduced into ripe unoccupied habitats. Thus began the most remarkable era, and the most far-reaching changes, in the long history of trout fishing. Today, if we think about this spread of trout at all, we probably think of it as a fairly minor effort that targeted a few likely waters in a few likely countries. Everybody has heard of the fabulous success of trout in such famous fishing destinations as New Zealand and Argentina. With that kind of ambitious coverage, trout are now pretty much everywhere they can survive by either natural reproduction or hatchery reinforcement. According to recent worldwide scientific inventories, there are now surprisingly few appropriate habitats on earth left unoccupied by brown trout, and the rainbow is even more thoroughly distributed. This says a lot about the demand for sport, and about the world’s love of trout. The original homes of these trout quickly became irrelevant to the distribution process. The 19th-century fisheries manager in some distant country who received one of those precious early shipments of browns or rainbows knew better than to summarily dump the lot into the nearest river. Once that first shipment of fish arrived, if he played his cards right, he need never order more. 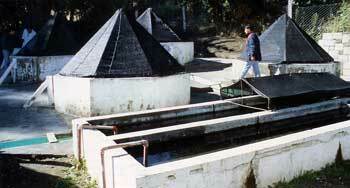 Local hatcheries were established everywhere, and soon were themselves the source of additional transplants. It was like a biological chain letter. A striking example of how this ricochet redistribution worked is provided by Africa. Amazingly enough, more than 20 African nations have either naturally reproducing or artificially maintained rainbow trout populations. But not one of those populations originated in a direct shipment from North America, the rainbow’s home continent. They hopscotched there from hatcheries in Scotland, Germany, Switzerland, England, Portugal, and several African colonies or nations. After more than a century of this energetic interchange, with fish zooming around like fleets of postcards, we now have a trout-rich world. It is, by many accounts, a fabulous success story, earning its pioneers the gratitude of generations of anglers. Seldom have so few done so much over so large an area with so little effort (or understanding). Now there are English skylarks in Tasmanian fields, European rabbits across Australia and in New Zealand, and red deer in New Zealand’s forests. Across North America English sparrows fight in the gutters and starling squabble in the trees. Everywhere the shock waves from these silent biological explosions continue to reverberate. However each of us may personally feel about this, Dunlap is telling us something important — that trout history no longer belongs solely to the trout fishermen. We aren’t the only ones who now care about what inhabits our rivers. These non-fishing river-lovers (as well as a growing number of fishermen) glare at us and suggest that we and our ancestors have a lot to answer for in all the places where carelessly introduced exotic fish have destroyed native aquatic ecosystems. These discussions get heated, ugly, and occasionally even violent. But let me stick to history here and leave the environmental controversy for other voices and other times. What I find most engaging about this latest twist in the epic saga of the trout is how shocked those earnest visionaries who started the whole thing would be to hear that anyone could object to what they were doing. After all, some of them believed that the home countries, like England, were doomed to become so ruinously polluted that trout would disappear there. What could be wrong in ensuring the survival of these beautiful animals in some remote corners of the earth? And besides that, what could possibly be wrong with redefining the earth as Planet Trout? I kind of envy those first fisheries pioneers the excitement they felt, being on a frontier of applied science. I certainly envy the fishermen who enjoyed spectacular fishing as those early transplants erupted into astonishingly productive fisheries. But despite my love for trout, I keep thinking about the darker consequences of what we’ve done. So perhaps most of all I envy the historians and anglers of a hundred years from now, who will get to look back and see how we will answer all these vexing questions about Planet Trout.